Volunteers after a clean-up in Kaimuk?? on Earth Day 2018. 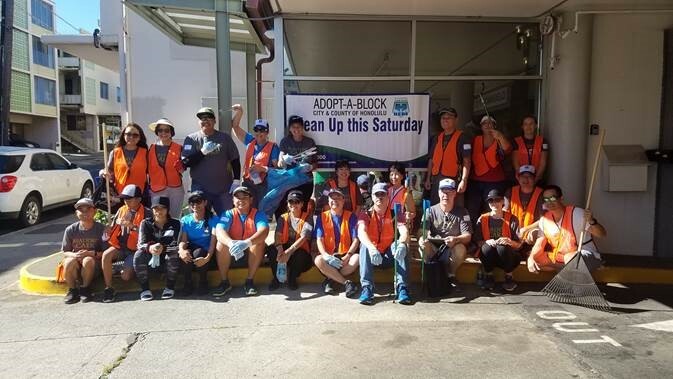 HONOLULU – The Department of Facility Maintenance (DFM) Storm Water Quality (SWQ) Branch is celebrating Earth Month with a series of Adopt-A-Block and Adopt-A-Stream cleanup events this April. Volunteers ages 12 and up can make a difference by participating in cleanups to keep Hawai‘i trash-free while serving as a clean water hero. Clean-up events for the month of April kickoff on Saturday, April 6 at 8 a.m. in Waipahu and Pearl City with the 14th Annual Pearl Harbor Bike Path Cleanup and culminates with the 12th Annual Mauka to Makai Environmental Expo on Saturday, April 20 from 9 a.m. to 2 p.m. at the Waikīkī Aquarium. The complete schedule of cleanups is listed below. Saturday, April 6, 8 a.m. – 11 a.m.
Saturday, April 6, 8:30 – 10:30 a.m.
Saturday, April 6, 6:30 a.m. – 9 a.m.
Thursday, April 18, 12:30 p.m.
Saturday, April 20, 8:30 a.m. – 11 a.m.
Tuesday, April 23, 3 p.m. – 5 p.m.
Saturday, April 27, 9:30 a.m. – 11:30 a.m.
All volunteers must be 12 years of age or older and will need to sign a release form to participate in the cleanups listed above. Participants should anticipate getting dirty, wear covered shoes, use sun protection, and bring plenty of drinking water. For more information, please visit www.cleanwaterhonolulu.com or call the Storm Water Quality Branch at 768-4319.